I am not ashamed to admit it: I’m a bibliophile: I love books. I love the feel of the paper as I turn each page and the musty old smell of you will never get from a Kindle. Of all of my books, I have a few favorites. Some books I love because they are classic and I find myself leafing through the pages over and over again (like my collected works of Shakespeare), some I love because they changed my life profoundly (for instance, my Buddhism collection). And still there are some that I love because of who they brought into my life (such as the text books I have kept written by people who started as professors and left my life as mentors and role models). Among these favorites is my 1898 copy (it was published in 1897 in French) of Cyrano De Bergerac that was once in the Johns Hopkins Library (from the Lanier Collection) that I purchased at Bartleby’s Books in Georgetown with my then-boyfriend J who was one of the most passionate men and bibliophiles I’ve ever met. He was also one of the most precocious and argumentative men I had ever met as well. While he browsed the children’s literature, I let my eyes wander. At first I was taken by the beautiful binding of the book, and then the delicate illustrations, but ultimately it was the title of the book that won me over: Cyrano de Bergerac. I was familiar with the story two ways -- the 1980s movie Roxanne with Steve Martin, and from the time in high school I was selected to act in a one-act excerpt/abridged version of the play (I was Le Bret, Cyrano’s friend). For $25, the book had found a new home. Cyrano ups the ante by fencing with Valvert while composing a poem (a ballad in this case). In other words, the imperfection of his nose does not limit or define him as a man or as a soldier. (He does let it limit him as a lover, assuming that Roxanne couldn’t love him because of his nose. But if you know the story, this turns out to to be a false assumption, as Roxanne loves Cyrano’s words and soul more than she does just the face/body of her young love, Christian). In June’s #GoTheDist challenge, people found it hard to look at themselves naked in the mirror. People felt vulnerable and exposed. Some people found it impossible to take a deep breath and settle in. It was hard to not fight the imperfections, instead allowing them to coexist with our whole self (i.e. not separate from the things we love about ourselves). So I asked that in July #GoTheDist we learn to at least not bully ourselves. So I just wanted to remind you of the story of Cyrano and how I got the message wrong: I thought Cyrano was the master of self-deprecating humor, having the first laugh at himself. However, Cyrano was ready to defend not only himself, but his imperfection(s), to the point of a sword. He was not laughing at himself, but holding himself in the highest regard because of his character, his courage (Cyrano introduced the English-speaking world to the word "panache") and his lack of pretense. So I’m going to ask you now, and ask you time and time again, to (1) love your imperfections and (2) defend them, as they are a part of your whole self. 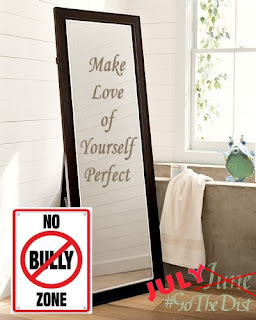 If you would not let someone make fun of your weakness(es), why should you be allowed to bully yourself? Do not mistake self-deprecating humor as being humble or lighthearted about yourself. If you treat yourself badly, you open the door to allow others to do the same. Do as Cyrano and always hold yourself in the highest regard. It isn't our imperfections that we need to change, it is our perception, eh?